Each financial plan our team creates is unique because we recognize that no two clients are alike. Everyone is motivated by personal values and passions, and responds differently to opportunities and challenges. A successful financial plan must account for those differences. That’s why our financial planners work hard to understand all the aspects of your situation. 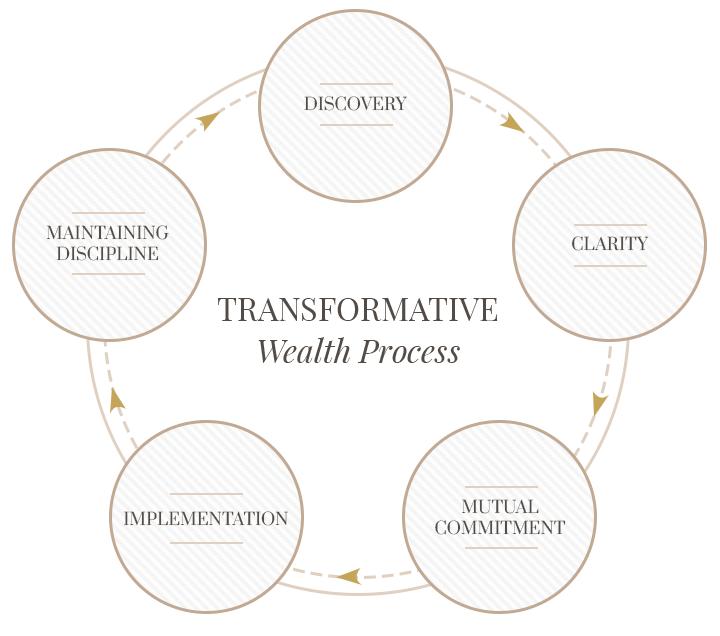 Our Transformative Wealth Process™ is the framework we’ve developed to help you create a plan for the things that matter most to you. It is designed to help you develop a clear understanding of your current financial position, so you can make informed decisions and move forward with confidence. The first step in a successful relationship is getting to know each other. We want to make a personal connection with you, so you feel comfortable and trust can begin to build. Our conversations will revolve around you; the values and relationships that motivate and define you, the things you want to accomplish, and the way you want to work with an advisor. It’s about much more than just your finances. Once we have gotten to know each other, our team will help you connect your current financial situation with what you ultimately want to accomplish. We’ll begin with an in-depth look at where you are today. Then we’ll discuss your options and our specific recommendations for moving forward, using interactive planning tools to show you how the decisions you make today will impact your future. After you’ve had a chance to consider our recommendations, we’ll meet again to address any questions you may have and agree on the terms of our relationship. If we reach a mutual decision to move forward, then we’ll formally establish our relationship by signing the necessary agreements and paperwork. As the elements of your plan are put into place, we schedule a follow-up appointment to make sure you’re comfortable. We’ll go over your first statement together, review the resources you have access to, and discuss what you can expect in the coming months. Our goal is for you to be confident that our firm is the right place for you. The most important part of the financial planning process occurs in the months and years to come. As time passes, your life will inevitably change and so will your goals and financial needs. Our team will be here to help you along the way, reviewing and updating your plan to make sure you stay on track. You can take comfort knowing that we’ll handle the details, so you can focus your time and energy on the things that matter most to you.